Long Island’s first Tractor Supply Company store has official opened for business. A grand opening for the store located at 3170 Route 112 in Medford was held on Saturday. 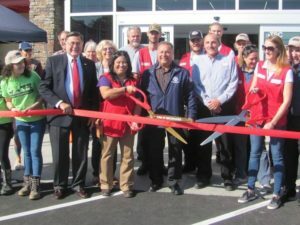 Brookhaven Town Supervisor Ed Romaine and Councilman Michael Loguercio were among those on hand to celebrate the grand opening. Tractor Supply has over 1,700 stores in 49 states. The company says it’s focused on fulfilling the lifestyle needs of recreational farmers, ranchers, tradesmen and small businesses as well as those who enjoy the rural lifestyle. Customers can find everything from pet food for small animals and livestock to hardware, tools and clothes for outdoor work or recreation.